With new rules and regulations each season, the NFL is starting to own up to the name of the “No Fun League.” In a recent off season rule change, commissioner, Roger Goodell and league officials ruled that the famous field goal post dunk will now be ruled illegal. Touchdown celebrations have been a unique part of the game where athletes were able to showcase their spontaneous and sometimes premeditated celebrations for fans and media. Stars such as Terrell Owens, Randy Moss and Chad Johnson have performed memorable celebrations to compliment their spectacular play on the field. 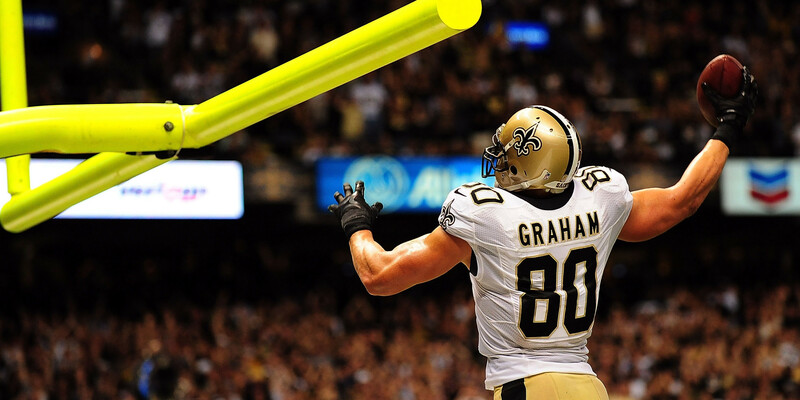 The popular field goal post dunk, a trademark celebration by Jimmy Graham of the New Orleans Saints and future Hall of Famer, Tony Gonzalez, was a trendy celebration where players would use the football as a prop to dunk on the 10ft goal post. 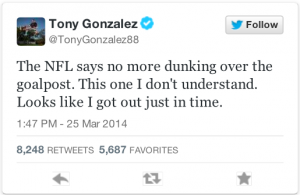 It is no coincidence that both Graham and Gonzalez both played basketball on the collegiate level, which may explain their choice of the banned touchdown celebration. 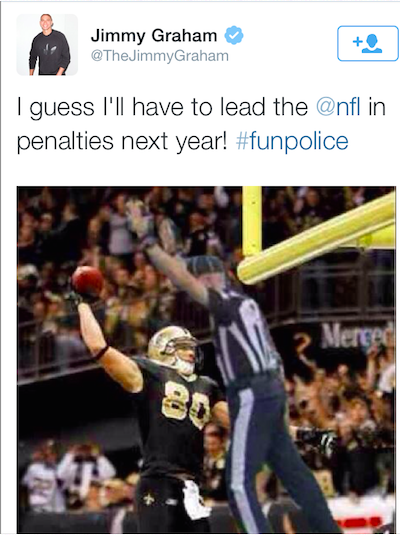 The recent ban appears to have evolved from the recent ban of using props in a touchdown celebration. Last season in a regular season game between the Atlanta Falcons and the New Orleans Saints, the game was delayed when Jimmy Graham brought down the goal post after his trademark celebration dunk. The delay that came as a result of the celebration might have pushed league officials to place this new rule change into effect. 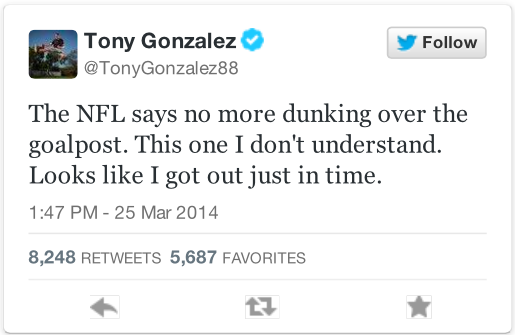 Both Graham and Gonzalez have expressed their opinions on the recent rule change via Twitter Tuesday evening.